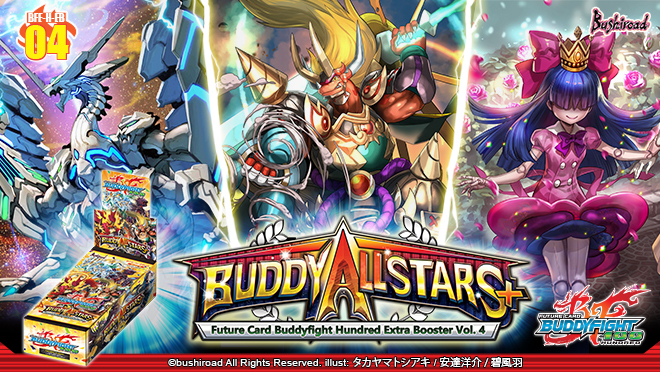 The largest Extra Booster containing your favorite monsters, BFE-H-EB04 [Buddy Allstars+]!! On top of popular monsters like Drum and Jackknife, “Demios Sword Dragon”, “Death Tallica” and many more monsters are back in new forms for more action!! All-new powerful cards from the Japanese edition product H-SS01 are also included in this product!! Command your new deck with the incredible strength of “Fifth Omni Dragon Lord, Crimson Drum”, “Commandant of Enma Alliance, Burn Nova” and “Jackknife, “Superior Plasma”"!! 106 types of cards RRR: 7 / RR: 14 (1 reprint) / R: 30 (1 reprint) / U: 51 / BR: 1 (Parallel) / SP: 3 (Parallel) + SECRET (Flag): ? *SECRET include flags from different worlds! 1 PR card will be randomly inserted into each display (2 types in total)! Parallel foils of Uncommon and Rare Cards are inserted randomly in packs!